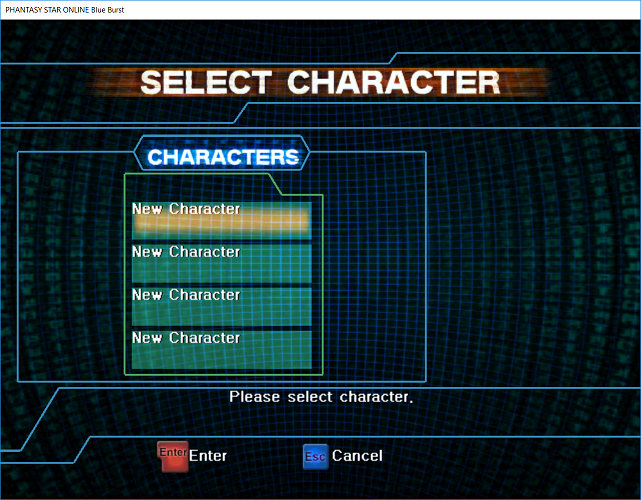 Once logged on, you can select either an empty or used character slot to create a character. If you select a slot with a character in it, you will get a dialog prompt confirming creation of a character in that slot, as it will delete the current character residing in that slot. Only proceed if you’re 100% sure you wish to get rid of that character. You will be presented with a list of classes to choose from for your new character. 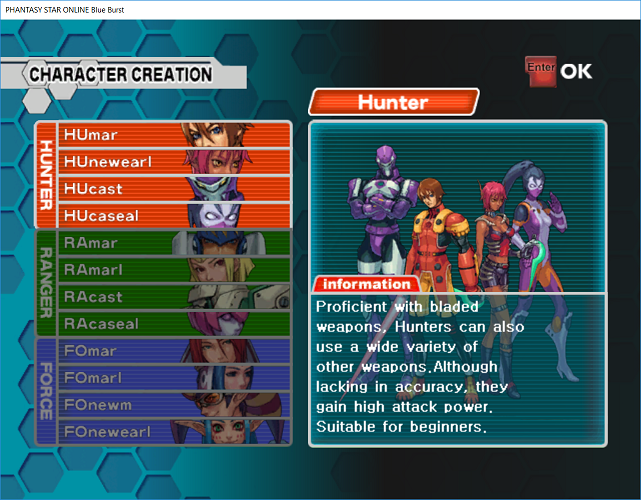 There is a description for each character class but the general idea is that Hunters are for those who like to be in the face of danger, up close and personal with their foes. Rangers, however, prefer to attack from afar, using various different guns. Forces, also prefer to attack from afar, but use techniques instead of weaponry to eradicate their enemies. Forces are also often the support glue that holds the party together, casting various buffs, debuffs, and healing party members who are injured. Playing a Cast character also allows you to regenerate HP and set traps for your foes. Playing a Newman character allows you to regenerate TP. Humans have no special racial ability, but they do get to use the most materials. Materials allow you to increase a character stat every time when used. All classes have different stat growth patterns and some are better than others when it comes to maxing out stats. 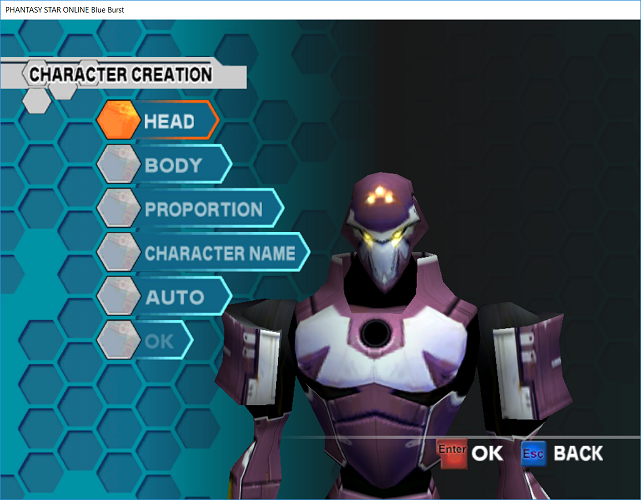 Once you’ve decided on a class for your character, you will be presented with a screen in which you can customize the look of your character. 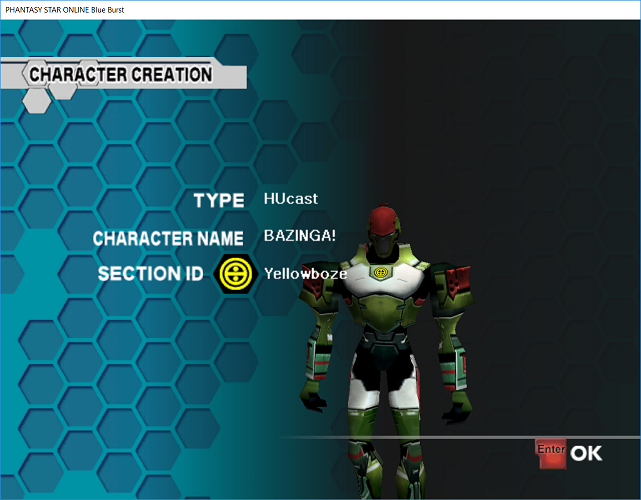 You can adjust things like head, face, hair, body, clothes, proportion, and, of course, your name. After you’ve got all the cosmetic things decided, you can select "OK" to create your character. A section ID will be given to your character based on their class and name combination. A section ID determines what kind of rare items and equipment your character will find over the course of their lifetime. You can check the drop charts to see what kinds of items your character will find after his or her section ID has been assigned. Don’t worry if an item you want to find is not able to be found by your character. You can always join the game of another player who is assigned to the section ID of an item you want to look for. Also, before level 20, you can use the Ephinea custom command “/modsecid” to change the section ID of your character once, so even if your name and class combination doesn’t make the section ID you want, you can change your section ID.